Are you looking for wheat free crackers that are low carb? 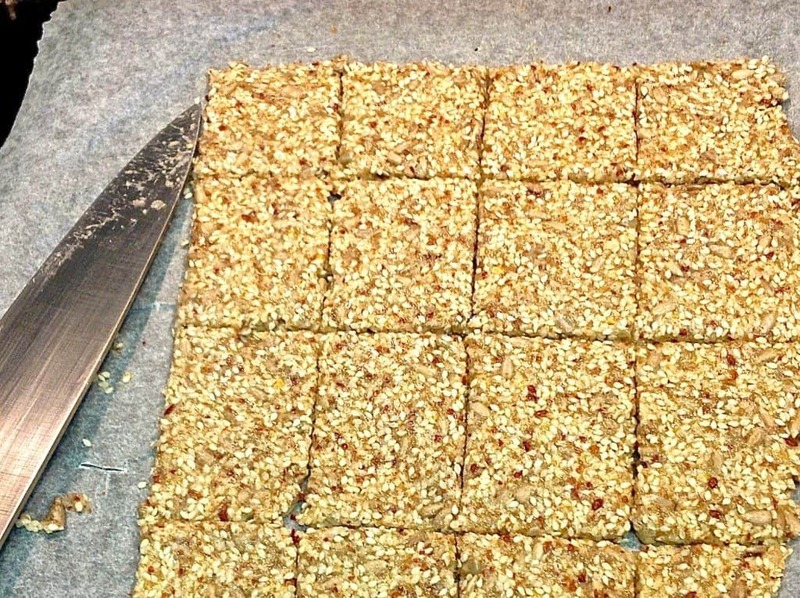 Are you missing that crunchy cracker sensation now you have given up processed food? 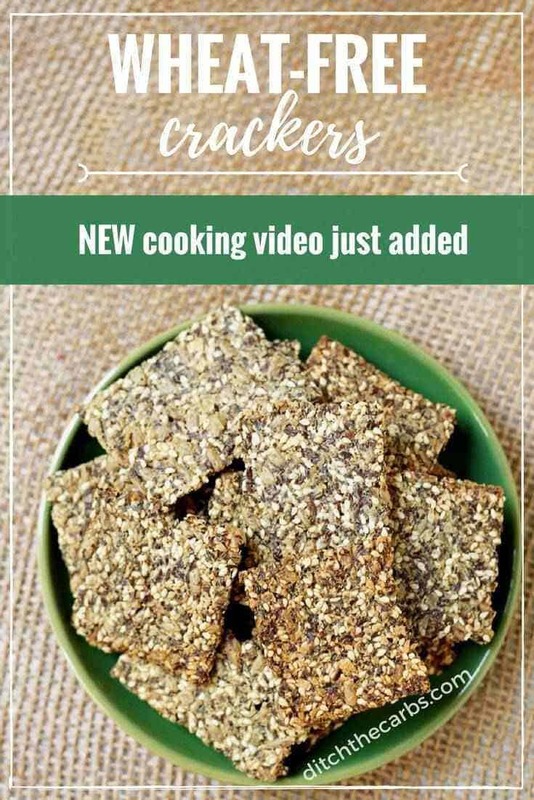 UPDATE – now you can watch my quick video and see how easy it is to make wheat free crackers. Make them any shape you want. Square, round, sticks or just break them into pieces. 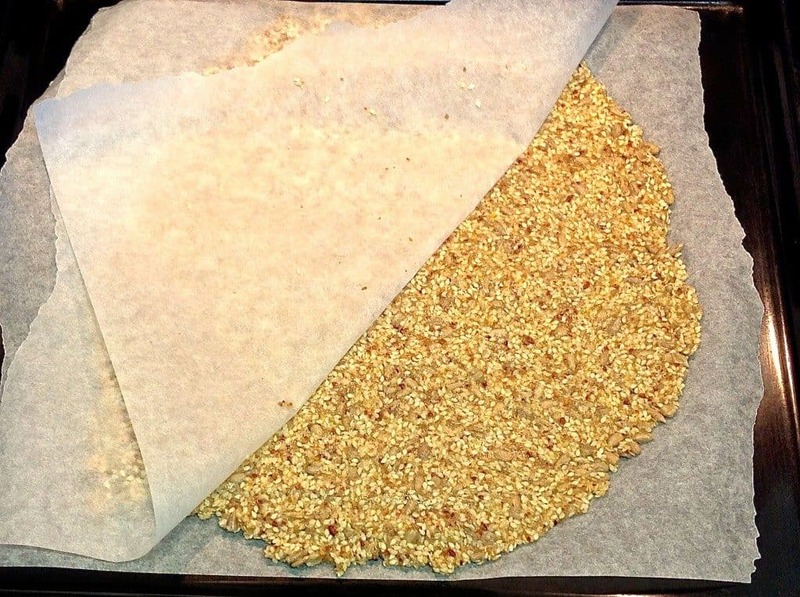 This is a great little wheat free cracker recipe to keep on hand. A crunchy texture is what so many people crave after giving up crisps, crackers and other convenience snacks. These wheat free crackers are also gluten free, low carb, and high protein that are full of seeds, fibre and not a grain of wheat in sight. Sesame seeds are high in thiamine, folate, calcium, iron and magnesium. 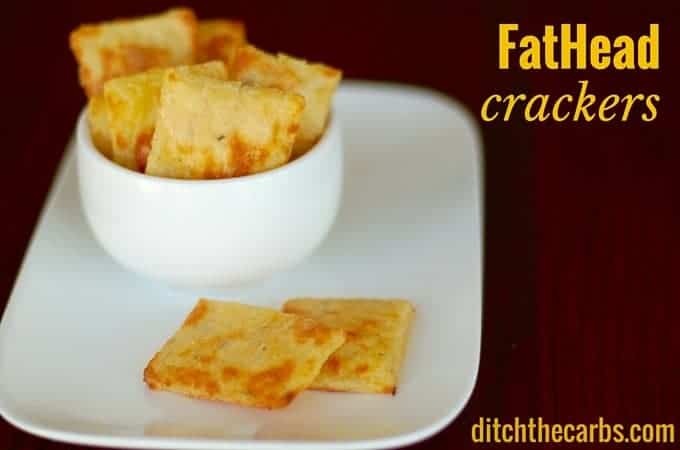 If you’re wanting a cheesey cracker, then try my low carb FatHead crackers. Why not add a hint of chilli? Serve these wheat free crackers with avocado, cheese, cold deli meat, pate, olives, or sun-dried tomatoes … You only need a few of these wheat free crackers to really curb your appetite. For more healthy snack ideas, take a look at this post. Brimming with ideas and help for those times when you need a little snack between meals. The beauty of living low carb, is that you stop relying on snacking after a while, but until then, these are my top 10 low-carb snacks. Wheat free crackers can be jazzed up with the addition of parmesan, chilli flakes, beef stock or garlic. Add the warm water, mix, then allow to sit and swell over 10-15 minutes while the oven warms up. Get 2 large sheets of baking paper the same size as your baking tray. Place half of the mixture in between the baking sheets and using a rolling pin, roll out as thin as you can (the thinner the cracker, the crispier they will bake). Remove the top sheet of baking paper, and cut score lines through the rolled out mixture, into cracker size pieces. Place onto baking trays and bake at 180C / 350F for 10-15 minutes. Remove from the oven and cut through the score lines and turn each cracker over. Bake for another 10-15 minutes until crisp. LSA stands for linseed, sunflower and almonds. It is widely found in NZ and AUS. The closest you can find in the US, is this mix of linseed, sunflower and pumpkin seeds. 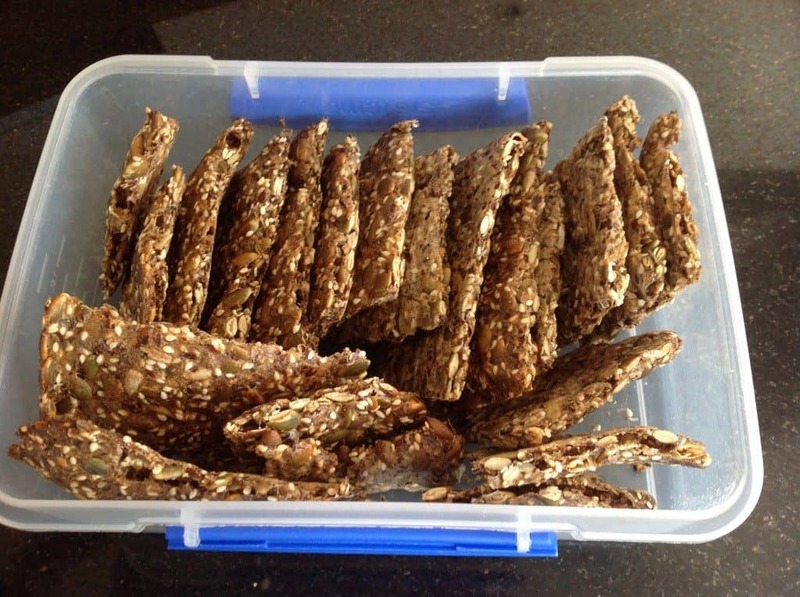 The recipe for wheat free crackers is very adaptable to what you have in the cupboard. Just ensure the final consistency is similar to the video and photos..
Maybe switch to the psyllium husk powder which has a finer texture. Or make these crackers instead, mainly cheese and almond flour – yummy! Hmm, it would depend on how large you cut the crackers. I would estimate I would enjoy 4 or so medium/large crackers for a quick and easy lunch. I would also enh=joy avocado, salt and pepper on top – yummo! Hi, i enjoyed making and eating these. They freeze well which is a bonus in the tropics. I also found scoring step is really simple with a rotary pizza cutter rather than a knife as it doesn’t stick. Thanks for the recipe. You really need to roll these very thin or else they will not bake crisp in the time given. Next time I would divide the dough into three or four lots so I can roll it thin enough for several baking trays. Overnight they became softer still even though I had stored them in an airtight plastic container. I have just put them back in the oven one day later at 160 degrees celcius for 45 mins to dry them until they are really crisp. Seems to have worked. I really wanted to get that crunchiness of traditional crackers which I miss. I was amazed at the amount of psyllium used in these but it works! I also used LSC [ground linseed, sunflowers and chia seeds] instead of LSA as this is what I normally have in my pantry. Hi Libby, do you grind the flax seed? Hi. I have been making these crackers since August last year and I love them. I haven’t made them for a little while now, but it seems that the quantity of ingredients has changed. More psyllium husk, less sunflower seeds etc. Has this affected the amount it makes or the original taste? Sometimes when I make a recipe again for myself, I improve it a little each time so I may have changed the quantities slightly but it wouldn’t have been very drastic. Just a subtle improvement. Hi Libby. Is 1 cup of psyllium husks correct? 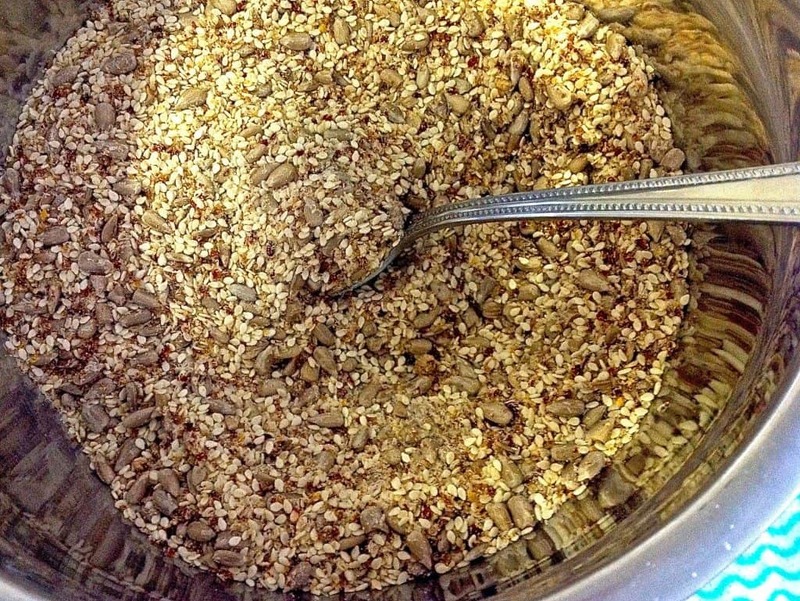 I make the seed crackers from the Real Meal Revolution which take 3 tablespoons. It makes enough to cover 2 trays and I break them up afterwards. One cup seems such a lot. Yes. 1 cup = 80g and it binds them together really well. Try with half the recipe if you are unsure to begin with. It makes a huge batch. If I do not have LSA can I just use all sunflower seeds? Sure, it might be a bit chunkier as there LSA is ground up and this helps the cohesion. Perhaps grind the sunflower seeds a little first. Actually I can grind up some almonds and sunflower seed but not as fine as almond flour correct? Yes, correct. Grind them just enough to provide a texture similar to almond meal. These taste great but the recipe makes a lot of crackers. How long will they keep please? You can keep them in an airtight container for up to a week. I’m in the slow and laborious task of going through 200 recipes and updating the computer code that shows my recipes, this one has translated LSA to linseeds, I’ve changed it back to LSA. Thanks for spotting it. in the nutritional info…is that carbs or net carbs? All nutrition panels are total carbs. To calculate net, simply deduct the fibre. I’ve just gone and calculated the entire recipe again but through cronometer.com You are correct, that was an error. This is an old recipe when I used to use My Fitness Pal. I found too many errors with that tool and this must be one of them that I didn’t pick up. Thank you for spotting it. Amazzzzing. thankyou,will try the fat head ones next. I didn’t have sunflowers so put in pepitas, recipe was great. crispy, crunchy, savoury. I might add more salt next time. I just went shopping and the store is out of psyllium! Any alternative I can use? The crackers look to good to wait to make. You really need the psyllium as it swells and keeps the seeds and the rest of the ingredients together. How about my FatHead crackers instead? They don’t need psyllium and are incredible. I made these yesterday. Delicious. I didn’t have LSA so I just made with L and A. Made these yesterday – they are seriously good – the whole household enjoyed them and even my girls wanted them for the school lunches! Thanks. Where do you get LSA? My internet search has been fruitless…but these sound good! LSA is a blend of ground linseed, sunflower and almonds. You could use any mix of seed and nuts to your liking if you can’t find LSA. Generally it is in the health aisle or near the alternative flours. I also have a fab cracker recipe for you to try. they are crisp and so delicious! first I make my easy peasy bread substitute which takes 5 mins. put 2 tbsp ground flax in a bowl with 1 egg, 1/2 tsp baking powder, a handful of grated cheese and 2 tbsp water. mix well and microwave for about 4 mins in a plastic square tub. when cool slice across so you have effectively 2 thin slices of bread, ( at this point you could just make a sandwich, as it makes great bread) but if you want crackers then cut each slice in half so you have 4 pieces. you can sprinkle a little grated cheese on the top if you like for extra yumminess! place in a hot oven for 10 minutes until crisp. I just keep these in a plastic bag and they stay fresh and crisp for days. they are gorgeous with tuna mayo on top. Please try them!! Yum, thanks Hilary. I will definitely be trying these.